I know today is a busy day up north in the USA. People traveling home for Thanksgiving, preparing the big meal for tomorrow, and all the other things related to the Thanksgiving holiday. So today I want to wish all the blog readers in the USA a happy and safe Thanksgiving, and I hope you have time to spend with your family. Here in Mahahual and Mexico, expats usually get together, or meet in some of the expat hangouts and have a pot luck Thanksgiving dinner. I know Mayan Beach Gardens, north of Mahahual, has a big Thanksgiving dinner, and a lot of the expats from the USA go there. Last night I was trying to explain the Thanksgiving holiday to a Mexican female friend of mine, and she could not understand why people would want to eat so much, that all they could do afterwards was sleep and lay around and watch football. I told her, that is what we do. So Happy Thanksgiving to all the blog readers out there, and I hope you have a good time with your families. This is an old blog I wrote about winter here. I have become a cold weather wimp. When I first got to Belize 4 years ago it was during the winter, and some cold weather came through and it got done to about 65 degrees for a spell. Well to my surprise in Belize I noticed a lot of Belizeans walking around in jackets and ski caps, and even scarfs. I made fun of Tiffany, who I was hanging around with at the time, because it was 70 degrees and she was wearing a jacket, long pants, and even a ski cap. She usually walked around half naked in warm weather, so seeing her all bundled up was different. It amazed me that people were wearing winter clothing in 70 degree weather. Even here in Mexico I noticed when it got down to 70 or so people got out their jackets and winter clothing. Recent Questions, Comments, and Responses About Mahahual. I have had a tremendous amount of comments, questions, inquiries, and responses on this blog lately. It is that time of the year again. As soon as it gets real cold up north in the USA and Canada, people get on the internet looking for paradise, and a warm place to go. I thought today I would share some of the comments and responses I have recieved lately, and answer them as best as I can. I figured other readers might have the same questions or concerns as some of the responses I have gotten lately. First, you have to get back on the main road to Xcalak from the coastal road because the wooden bridge that connects the road to Xcalak washed out, and because of the main highway that everybody takes, there is no big hurry to repair it. There are numerous places to stay in Mahahual on the malecon, or you can try one of the eco resorts along the coast road. You can find these on the internet, or you could read some of my reviews of the places around town on this blog, that i have done in the past. Mahahual is a great place to swim and snorkel, because of the reef the waters around Mahuahual sometimes look like a swimming pool, and the snorkeling is excellent. I love your question about the metal detector, I myself have a metal detector, and I left it in the USA, and would love to have one down here now. There has been many a day I have sat on the beach in Mahahual, and thought to myself, “Man I would love to have a metal detector down here, no one ever uses one here.” I am sure your husband would have a great time exploring Mahahual. If you want a nice quit place, that is not too expensive, and great beaches, yes I think you should consider Mahahual to retire. Lots of friendly people, nature, and great climate. Mahahual does not have a lot of crimes or break-ins. Most of the beach houses out of town or in secluded areas usually have caretakers, or even domestic help that lives on the property year round. You can also have someone house sit for you while you are gone, usually just room and board. I will be happy to meet you when you come to Mahahual and show you around. I was born in Chattanooga, and ended up in South Carolina. One thing I have noticed is, southerners can relate to the climate year round down here better than say some from New York or other northern states, we are used to it being hot. Prices in Mahahual for houses and apartments range from 3,000 pesos to 5,000 pesos and up. I saw some real nice furnished apartments last week for 4,000 pesos a month (about $310 usd ) in the village. For more on prices go to Costa Maya link on this blog, or contact our offices. If you are interested in buying, you can get a 2br house for around $42,000 usd or somethig nicer in the $100,000 usd range. These are on our website. This is a comment i recieved lately from someone I took to Mahahual. Another comment i recieved from a reader about a blog I posted about safety in Mahahual. Another one concerning my series of articles about Belize. This one is about shopping in Mahahual. “Oh how I love the little supers in Mahahual? In the states the stores are so large I hate walking from one end to the other to find what I need. I miss the small stores like you have. That’s what I was used to growing up, just a small store that carries the basics. What more could you ask for! I hope some of these helped give you an insight into what other people around the internet are saying and thinking about Mahahual. 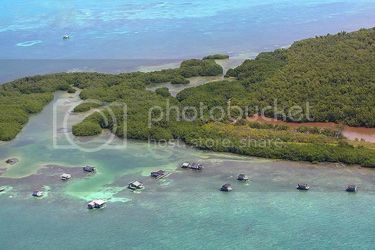 I started a blog when i first got to Belize, http://www.oasisresortbelize.wordpress.com , before I ever thought of moving to Mahahual. I was looking back in the archives, and I thought I would share on this blog. It is my first impression of Belizean health care. Because of all the Belize discussions on this blog, I think some people might find this interesting. 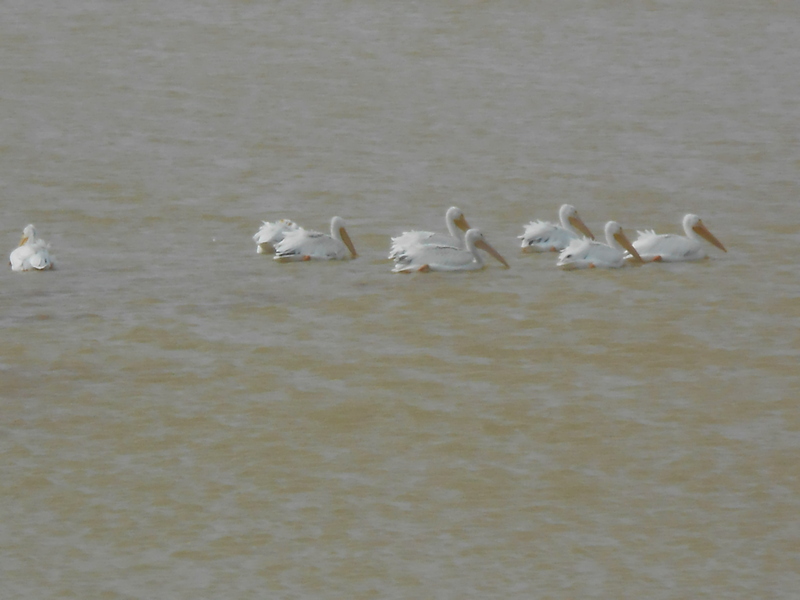 The fore mentioned blog I started when I was living and working in Corozal. If you want a first hand view of my life and thoughts in Belize before I came to Mahahual, you can read some of my old stuff. Malecon after cruise ships leave. The place to be when you are in Mahahual is the malecon on the beach. Malecon means basically “Boardwalk” in Spanish. The malecon is a pedestrian walkway with the beach to the east and businesses to the west. 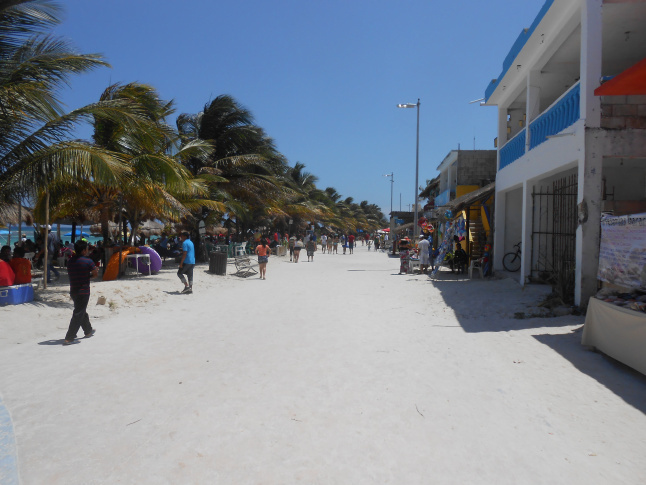 Many nice restaurants and shops line the malecon in Mahahual. 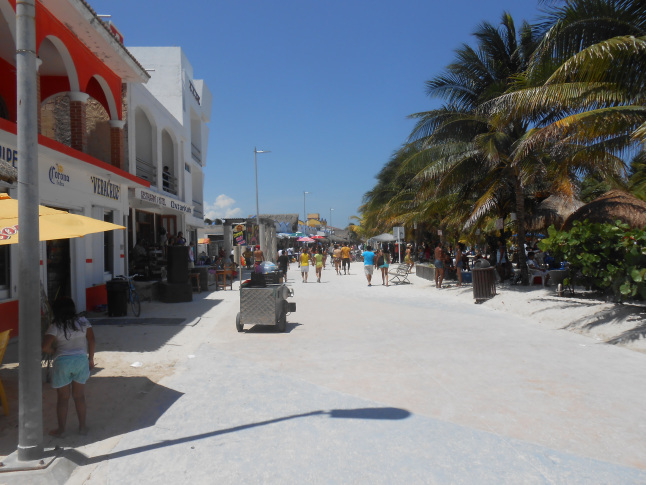 The downtown Mahahual malecon, although it is still in its infancy, it is already one of Mexico’s most spectacular. Mahahual, one of Mexico’s nicest and most pristine beaches, has the clear blue Caribbean sea, and a reef that runs the length of the entire downtown, protecting the beaches from any wave action and making the entire village beach like a giant swimming pool with palm trees. Cruise ship day on the malecon. Beach massages on the malecon. View from start of malecon to cruise ships. 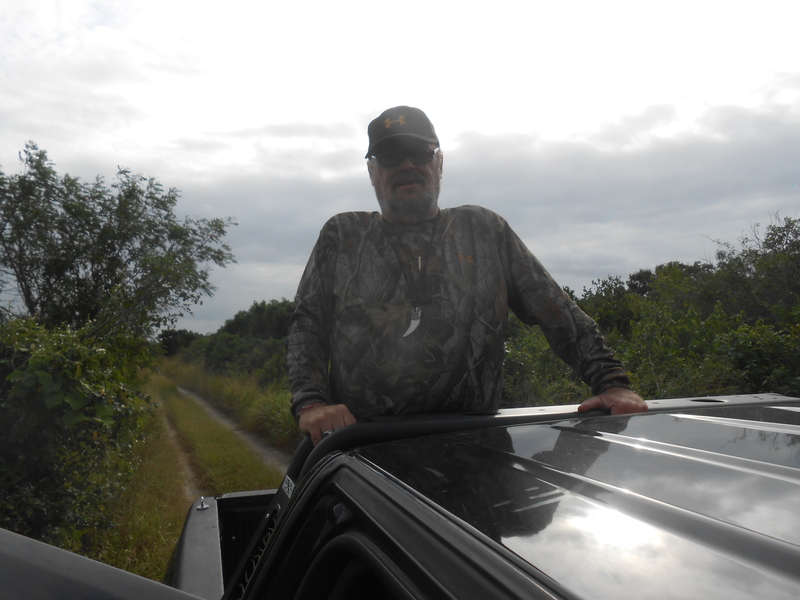 Me in Rio Lagartos, Yucatan on bird watching tour to see the flamingos. I have been getting a lot of interest and inquiries from a lot of you blog readers lately. I know a lot of them are because of the cold weather and the political climate in the USA now. I have been very busy lately because of the factors I have listed above. 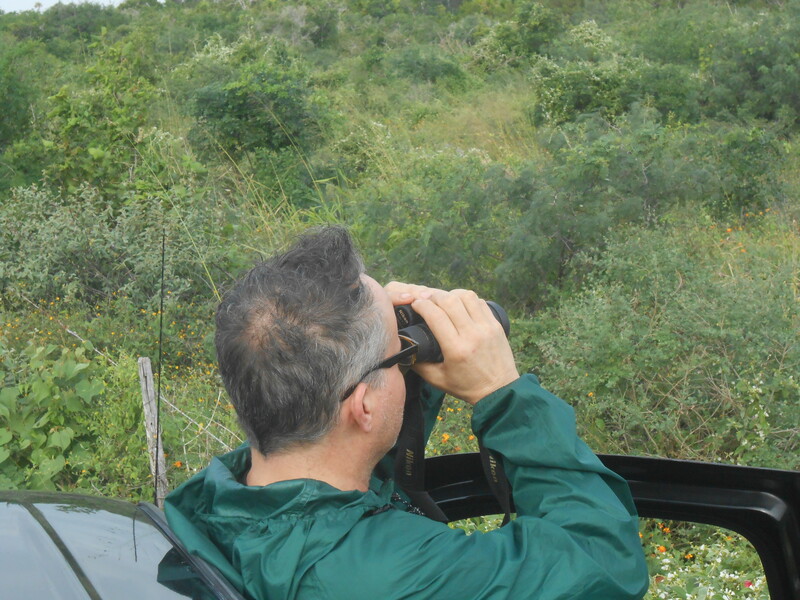 I recently took two women from Quebec, Canada on a tour of Mahahual and Bacalar, and I just got home last night from going with a man from South Carolina, Bob Critser, on a birdwatching tour in Rio Lagartos in northern Quintana Roo. I have been a bus or car for the last two weeks, and have been all over the place down here. 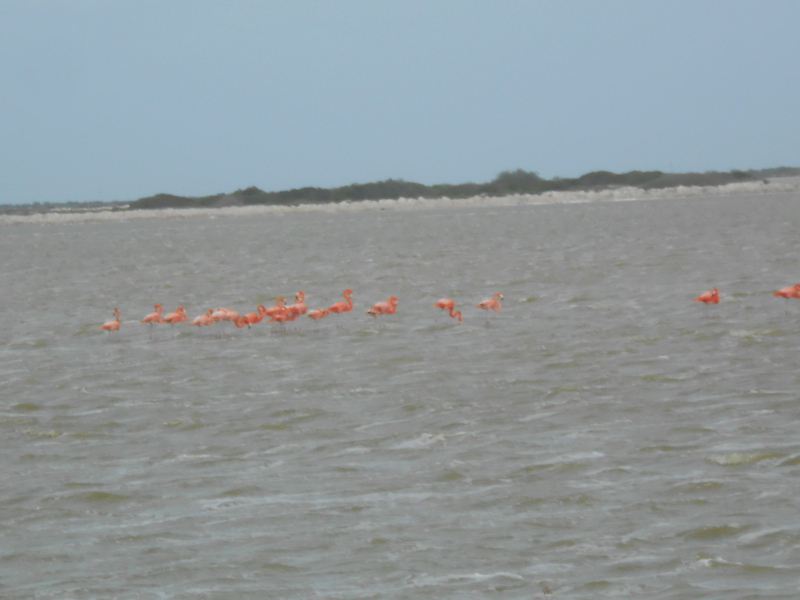 Pink Flamingos on salt flats on Los Colordos. If you have any questions or inquiries about living, visiting, or retiring down here, write me an email s.rogers.920@hotmail.com, or hit me up on Facebook, Stewart Rogers Mahahual, Mexico. If you have real estate questions or inquiries and you need immediate attention, you can contact our offices at http://www.realestate-costamaya.com, or call (52) 983-834-5999, or cell (52) 983-139-2445, and you can even Skype Costa Maya, and either Carlos or Monica will help you. 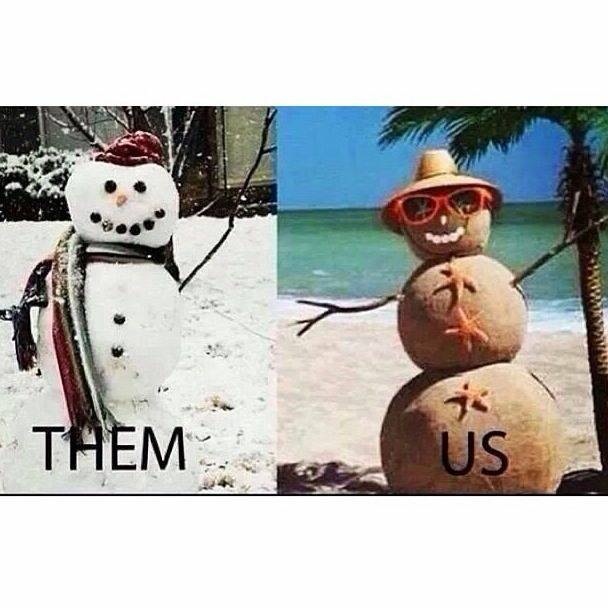 The “Snow Birds” are descending down here in droves and more are coming after the holidays. What I find funny is, during the summer months and fall, I sit down here and beg people to come visit, and nothing. But as soon as it snows or gets cold up north, or some idiot is elected to office in the USA, then everybody wants to come down here. I have had practically nothing to do the last several months, but write the blog, now I am running around all over Quintana Roo and the Yucatan, and answering emails and requests and inquires from people wanting coming down to live or retire. I also am getting a lot of the “I am fed up with the USA” and “I am sick of the political system in the USA” rants, and people looking to get out of the USA. I get these after every election no matter who wins, so I do not pay much attention to these, because they usually pass. So if you are interested in coming down let me know, and we can arrange something for you. If you are scared or worried about your safety here, don’t worry I can meet you in Cancun and travel with you to Mahahual or anywhere else in Costa Maya, I do it all the time. So if you are tired of the freezing weather, high cost of living, and corrupt politicians in the USA, and want to get out, contact me and I can take care of you, or find you somebody that can. 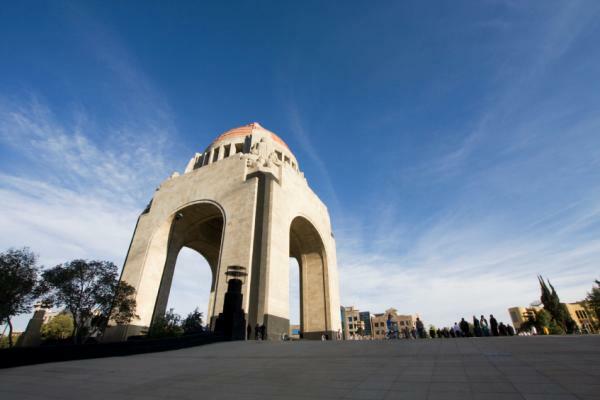 The Revolution Memorial in all its glory in Mexico City, Mexico. Mexico’s Revolution Day (Dia de la Revolución) is a national public holiday that celebrates a 10-year revolution that began in 1910 to end the struggle against dictator José de la Cruz Porfirio Díaz Mori. The public holiday falls on the third Monday in November, near the official day on November 20. Outdoor events such as bazaars, festivals and parades are part of the Revolution Day celebrations, where shouts of “Viva la Revolución!” and “Viva Mexico!” are heard. Stories are told or sung about the revolutionary heroes who ended the struggle and helped to reform Mexico. Festive foods include enchiladas, tostadas, tacos, and fajitas. The Mexican flag – a tricolor of green, white and red with the national coat of arms in the center of the white stripe – is flown on Revolution Day. Revolution Day is a public holiday in Mexico. Banks, schools, government offices and many businesses are closed. Some streets and roads may be closed or restricted in towns and cities to make way for large celebrations. People intending on travelling via public transport in Mexico should check with public transit authorities on any timetable or route changes. The Mexican revolution started in 1910 to get rid of president Porfirio Díaz. He originally tried to revolt against Benito Juárez in 1871, but did not come into power until 1876, when he was president for one month. He was also president from 1877 to 1880, and from 1884 until 1911. While economic growth and modernization occurred, this progress did not filter through to many Mexicans, including labor workers and people in the poorer parts of Mexico. Several key players, including Francisco Madero, organized the revolt against Díaz. Madero was then elected as president in 1911. November 20 was the original public holiday date for Revolution Day until 2005. A change in Mexico’s labor law instituted that Revolution Day would be a public holiday across the country on the third Monday of November as of 2006. A bandit and Robin Hood outlaw named Pancho Villa played an important role in the Mexican revolution. He became a legendary hero not just for robbing the rich and sharing with the poor, but also for leading one of the most crucial military campaigns during the uprising.